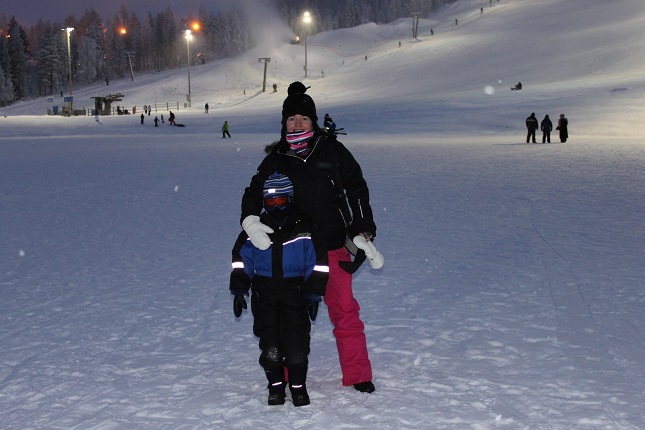 We stayed a week in Finnish Lapland, having been twice before skiing and then visiting with a young child, we amassed a few tips and hints which I thought apt to pass on, maybe helpful to someone else preparing a holiday in this winter wonderland. First up, sounds obvious but could never be stressed enough – wear the right clothing. We saw several people emerging from the plane dressed for a (mild) UK winter – definitely not a good idea. Layers, layers, layers are the order of the day and waterproof outer clothing is a must. Temperatures are super cold during the day – on the first three days of our trip it was minus 28 degrees centigrade although it did warm up to a balmy minus 15 degrees by the end of the week. You desperately need thermal socks, waterproof and insulated gloves or mittens (I found these preferable to stop hand freeze) and hats that cover your ears. A balaclava for covering your face when doing any activities is also a good idea, it makes breathing more bearable. Make sure you have good boots too – insulated, waterproof and with a good tread. 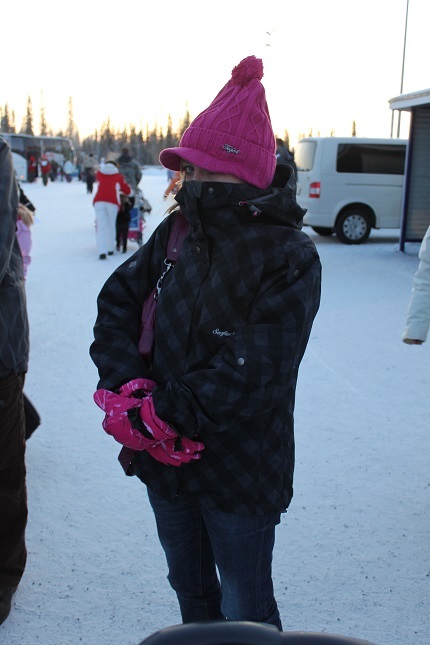 We also took along goggles for the reindeer and husky rides, it makes things more pleasant and stops eyelash freeze. Thermal suits and boots do tend to be available for hire in the resorts – these were included in the price of our holiday. They are not though a substitute for the waterproof clothing above, just a handy extra was what we found. 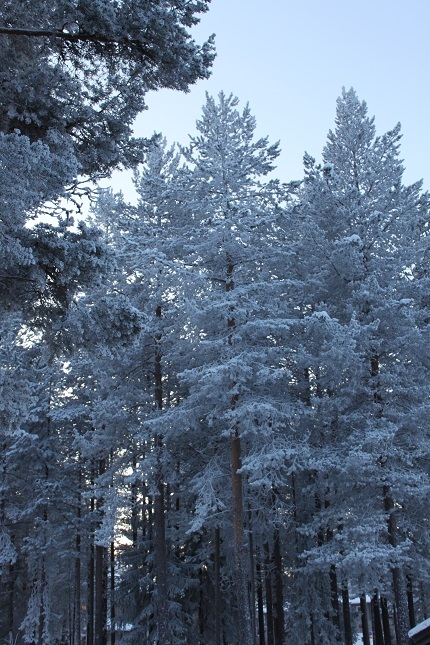 The temperature immediately strikes you in Lapland – you need at all times to be togged up in endless layers of clothes, even if you only venture outside for five minutes. Be aware of the temperature at all times. If, like during our visit, it becomes exceptionally cold – i.e. minus 20 degrees centigrade or less, you really need to manage your time outside and keep going in every 15-20 minutes or so to warm up. You also need to keep a really close eye on children and make sure all areas of skin are covered. Lapland packages are marketed in the UK as being primarily about Santa with one or two activities thrown in and seem to me rather rushed affairs. From the moment we stepped off the plane we realised Santa is just one of a multitude of reasons for coming to this most unusual part of the world. The Santa trips tend to be 3 days, we thought this was nowhere near enough to properly explore and we needed every second of our week there. 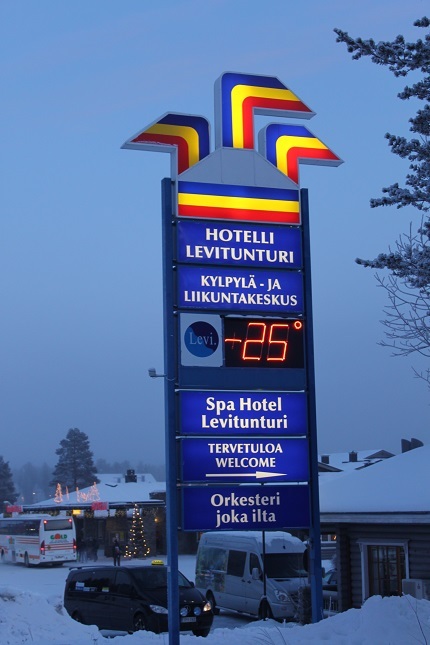 We stayed in Levi – a small town with shops, a bowling alley, restaurants, bars and a few hotels. Choose your resort carefully – some places are a bit more wilderness like. Levi was perfect for us – small but with plenty going on. We flew into Kitilla airport and the transfer by coach to Levi took only 15-20 minutes, another win. Christmas is the coldest and darkest time of year but a good time to see the Northern Lights – having been three times though, they have stubbornly refused to appear to us. During December, 150 miles above the Arctic Circle, the sun does not rise properly. Instead from 10am to 3pm there is a violet tinged sunlight. I cannot emphasise how unusual and beautiful this is. The local language is Finnish, but, as elsewhere in this country, everyone speaks excellent English. Traffic on main roads is sparse, distances are great and driving conditions seemed to be hazardous. I would definitely not feel comfortable hiring a car and driving in this area. Sample the reindeer and cloudberry – but don’t tell your child he is eating Rudolph! Reindeer is served in soups, stews and as a meat dish – we thought it was delicious. Apparently cloudberry is the world’s most expensive berry. It grows in swamps here and contains lots of Vitamin C, it is also yummy. Take loads of time to play in the snow – so much fun for adults and children alike. 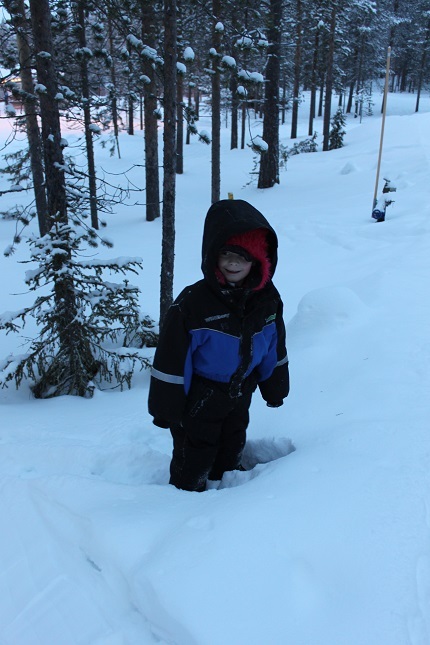 We strayed off the main thoroughfares a couple of times and frequently found ourselves in waist deep snow – the novelty never wore off. Photography I found could be a bit frustrating. I kept my camera inside my coat when not in use and the warmth of your body keeps the battery from draining. I also found mittens to be the best thing, my hands froze even in the short space of time it needs to take a photo. Pulling mittens on and off was so much easier than gloves. Lastly this is a holiday perfect for adults and children but the optimum age for little ones, is, I would say 4 or 5 years plus. Any younger than this and the cold would be incredibly challenging for them. If you want to have a “Santa” holiday they probably need to be under 8, any older and the cynic might sneak in. Our son at 6 years old was the perfect age, completely taken in and awestruck by Santa but old enough to fully take part in most of the other snowy activities. 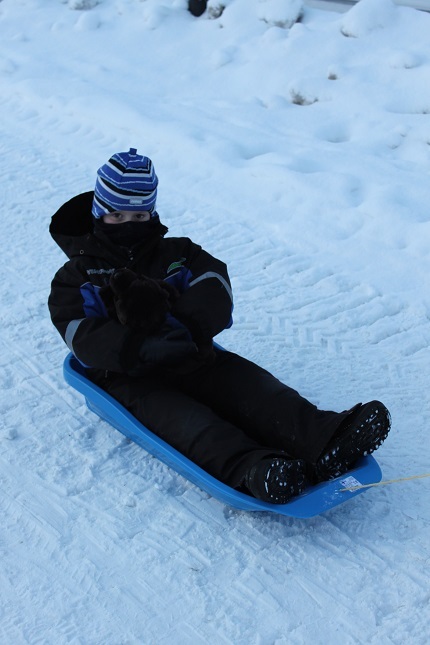 That said you’re never too old for Lapland….. our 12 year old is now desperate to return. So are we. Good stuff, I’ll book mark it for future reference! Some of it sounds obvious, but the temperatures are like nowhere else, I’ve never felt cold like it, you definitely need to be properly togged up. Lapland is on my hit list. Reading with interest. Love that you have included a tip to ‘prevent eyelash freeze’. Ha ha – it sounds bizarre but happened to me all the time outside – those goggles were a lifesaver!! Oh yes I forgot about those, they would be fantastic, we didn’t have any while we were there but if we go back I will be bringing some along!! Wow, that looks amazing but alos very cold…! It must have been beautiful too around Christmas time! So so cold Erika, like I’ve never felt anywhere before but so magical too and the perfect Christmas trip! I always think it must be amazing to be there at that time and even experience that cold. But I could never imagine living there winter by winter! No I completely agree – nice to visit, not to live there! It got down to minus 27 at one point one day and I know it sounds hard to believe but minus 15 actually felt so pleasant!! I guess it’s all relative – in a mild, wet UK I find it hard to imagine even one degree below zero today!! This is so useful! And sensible–if I ever get to go, I’ll remember your hints! It’s so different to anywhere else we’ve ever been and this was what struck us most. Hopefully helpful things!! Yikes! It certainly sounds and looks beautiful, though. Thanks for the excellent descriptions and images. It is the most incredible place, unlike anywhere else I’ve ever been! Oh Joy! This is fantastic! How far in advance did you plan and can you share the travel agent you used? We didn’t plan too far in advance Melody, I think we booked it in the summer time and travelled the week before Christmas. We used a company called Inghams – I think their website is inghams.co.uk – mainly because we’d used them for ski holidays in the past and knew what they were about. What fun for your kids 🙂 loved this! It is such a fun and gorgeous place – especially at Christmas! It is just glorious Linda, the most perfect pre Christmas trip! Very beautiful pictures. Looks like you had fun Joy. Oh we had so much fun, it is such a wonderful and special place, would love to go back now! The partial day light sounds interesting. I’d really like to see the northern lights though! We’ve failed three times with that one, so disappointing. One time people said they’d seen them, by the time we got layered up and went outside they’d gone! I would love to see them one day – maybe we’ll get lucky!! It’s just so bland here weather wise maybe that’s the reason!! It’s surprisingly OK Lynda when you have all the right clothing, plenty of thermals, hats etc.. except if it dips below 25!! It looks like you had a great time ! I can’t believe it has been a year already, since we have been to the Swedish Lapland. I would love to visit the Finnish lapland as well ! It seems less dark than at the end of the month. We had sort of daylight until around 2.30 ish, I loved it though and the snow just brightens everywhere up…. complete contrast to our dull, dark and dreary weather. Lapland is somewhere I’ve always wanted to go, but I was slightly concerned it was aimed at families, with the whole Santa thing. Good to know there’s some stuff for adults to do too! There’s loads to do, we went twice without kids and loved it every bit as much. Often it’s marketed as all about Santa but you could easily spend a week here without him and never stop. The cold hits you here immediately as you get off the plane Rosemary, I don’t know how those people were able to function!! We stocked up on all the heavy duty thermals, proper outer gear and still found the very low temperatures challenging. They have some wonderful shops there too though, the perfect excuse for me to stock up (further) on gorgeous hats etc.. There is loads to do here Rosemary, we were just talking the other evening and all said how much we would love to go back. I remember the last time I was over in the UK in January (quite a few years ago now) and my lungs literally hurt with the cold when I went out for a walk one morning and yet it was probably only minus 1 or 2! The cold aside, I would love to go here one day it looks so magical! I also would need no excuse to stock up on hats either!! 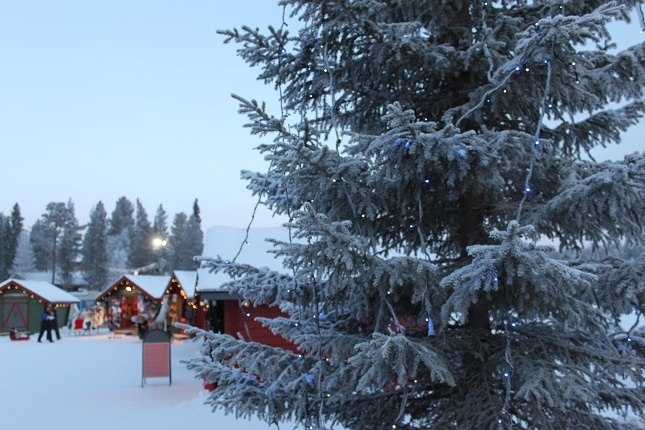 Levi is a great place to spend a winter holiday in the Finnish Lapland, plenty of things to do for children and adults alike. It might get a bit too cold up there at times, so I am quite happy to live in the south of Finland! 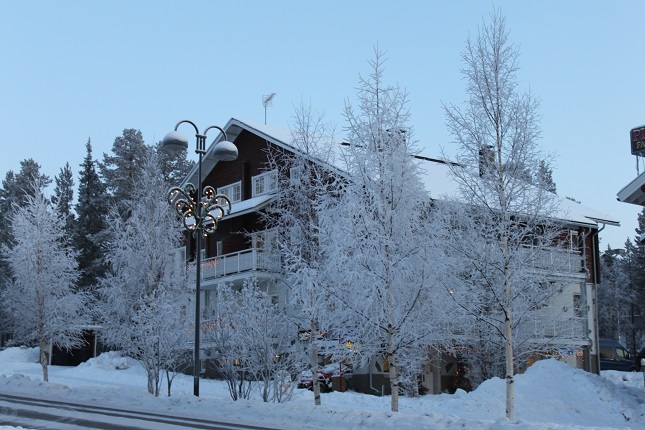 However, a ski holiday to Lapland is a must once a year! It was so incredibly cold but for us that was actually part of the whole experience and we didn’t mind it one bit – layering up helped!! 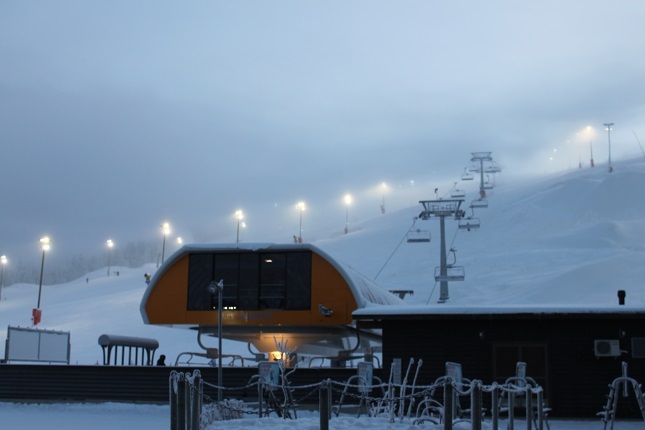 You are so lucky to be able to ski up there once a year, we would just love that!! We waited until our son was 6, there were some much younger children but they did look to be really struggling with the extreme temperatures. I think everybody enjoys it more when they’re that little bit older. I was wondering what the best age would be. I suppose I don’t want to leave it too late, either! Good shout about clothing – I am contemplating this when we go to Iceland in Feb! 6 was a perfect age for our child, I suppose though it depends on the child. The next year he was definitely not such a firm believer in Santa!! The clothing is so important and is the make or break between having an amazing time or being miserable. We went to Iceland in May and it was colder than normal then, we were prepared but did have to stock up on a few bits there. Love your post 🙂 I was there 2 years ago for a week, too. And good observation about the clothes. I was dressed like I was off to explore the North Pole with the British Expedition. In fact, I probably had more clothes on me than them – and it wasn’t too much at all!! We were exactly the same with the clothing – and like you say, it definitely wasn’t too much!! Great tips there Joy! Best wishes to you and the family for 2016. Look forward to reading more of your exploits through the year. Best wishes to you too Denzil – hope 2016 is a great one for you!! I think we will get to this part of the world eventually. Happy New Year! Thanks for the follow here too!! Love your blog and really looking forward to reading more of your travel adventures. Still chuckling about your husband’s ancestry, that is such a great quote!! We loved Lapland, definitely a magical experience and I would go back, even without the reindeer relations!! Pingback: 10 heritage travel posts of my choice – Fun Museums!